When my son was little he love, love, loved animals. Because he was a loud, impulsive, and hyper child, the animals (particularly cats) didn’t love him back. Because he couldn’t love real animals as much as he wanted, he collected stuffed animals and gave them lots and lots of love. I’m sure that you can think of a kid or two who, like my son, might not be able to experience the joy of caring for real, live animals. Try this idea for a dramatic play area to give all of your kids the opportunity to shower animals with lots and lots of love. Perhaps dramatic play will even help kids with self-regulation so that they can start caring for real-life animals. Imagine the sweet giggles of delight you will hear when you set up an animal shelter in your classroom. Your kids will not only have fun, but they will also learn why animal shelters play an important role in our community. Most of the printables in this post are available in my store, but you can find a free printable to download at the end of the post. I added several links at the bottom of this post. Use the links and ideas to help you shop for props to add to your center. There will be no additional cost to you when you make a purchase from a link, but a small portion of your purchase will be used towards maintaining this website…and for that, I thank you. The first thing that you need to do when transforming your dramatic play area into an animal shelter is find some cute and cuddly animals. I recommend the stuffed variety. If you don’t have many stuffed dogs, cats, or bunnies ask parents, friends, and your neighbor Bob. In no time, I bet you will find people who are willing to donate a few gently used stuffed animals to your classroom. Think about all of the big hugs that these soft bundles of cuteness will get. These stuffed animals are the luckiest stuffed animals EVER! Some animal shelters keep animals in cages, kennels or crates. You can set up small animal kennels or animal carriers in your dramatic play center. If you don’t have any of these, you can use plastic tubs/containers to house animals. Use old towels or baby blankets to make a soft, comfortable bed for the critters. Don’t forget to add small food and water bowls. Some animal shelters, particularly cat shelters, allow animals to roam around in a room. Make animal beds by placing a pillowcase or small towel in the bottom of a basket or shallow box. Use baby gates to make a little play yard where dogs can play. Ask your kids if they have ever visited an animal shelter. What was it like? They might be able to help you with additional ideas. A few months ago, I found some clear plastic jars at my craft store. The craft store displays them by all of the slime supplies, so they think I bought them for slime storage. I use them to store my little erasers, counters, and every treasure imaginable. I bought a bunch of them. We found that the little jars also make a great pet food container for a pretend animal shelter. You can also cover a small, empty potato chip can with paper to make a pet food container. Fill the containers with pom-poms, crumpled paper, or dry beans to serve as pretend dog and cat food. Inexpensive pet bowls are available at the dollar store or thrift store. Plastic deli containers or yogurt containers will also work great as a food and water bowl. Small travel containers work perfectly as medicine bottles. You can fill them with crumpled tissue paper, small pom poms, or even craft noodles. Do not use empty prescription bottles. We do not want to encourage children to play with prescription bottles. Use aprons, smocks, vests, or colorful t-shirts as a uniform for shelter employees or volunteers. A white button-down shirt from the thrift store can serve as a coat for the veterinarian. Now that my son is older and much less impulsive, animals do like him. He and I volunteer together at a local cat shelter and I can tell you that there is plenty of cleaning to do there. Lots of cleaning. Provide a desk area complete with phone in your shelter. Kids need to manage the day to day tasks of running an important non-profit. Don’t forget to add a non-working computer or electronic device. Employees need them to keep records for all of the animals, to communicate with volunteers, and to design an amazing website. Kids can also create animal posters in the office area. We found the best dog in the world after reading his profile on a poster in the lobby of a dog shelter. His poster told us that he loved kids, that he was crate trained, and that he wouldn’t eat our cat. We had to check him out and, I am so grateful that we did. Supply your office with paper, markers and don’t forget the tape so that kids can hang the posters all over the room. A Reading Area: Some shelters encourage kids to come in to read to the animals. Add some lounge chairs and books. Donation Boxes: All shelters appreciate donations. Use a box with a slot in the top for cash donations. Kids can stick play money in the box to support their shelter. Use additional donation boxes to collect food, blankets, toys, etc. You can even use this as an opportunity to do a community service project and collect real donations for a local animal shelter. Additional Pet Supplies: Use your imagination to find additional props to add to your shelter….brushes, combs, cat toys, leashes, dog toys, etc. One of the things that I love about the dramatic play center is that kids have so much fun that they don’t even realize that they are learning. 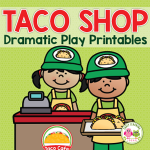 There are many ways that you can add some literacy opportunities to your dramatic play center. Use this printable to help your kids make collars for each animal in the shelter. 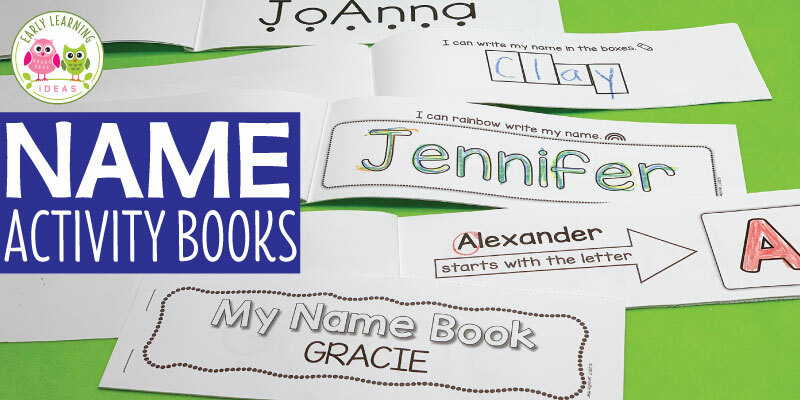 They can customize the blank tags with a letter or name. Guess what?….. This can be a great fine motor activity too. Hole Punch – Provide a hole punch to add a hole in the top of the tag. Stringing the Tag – Finally, they can string the tag onto a pipe cleaner color. Up the wow factor and fine motor challenge by adding beads. You can provide additional literacy opportunities by letting kids make schedules for shelter employees and volunteers, design a web page mock-up for the shelter and create name cards and posters for the animals. 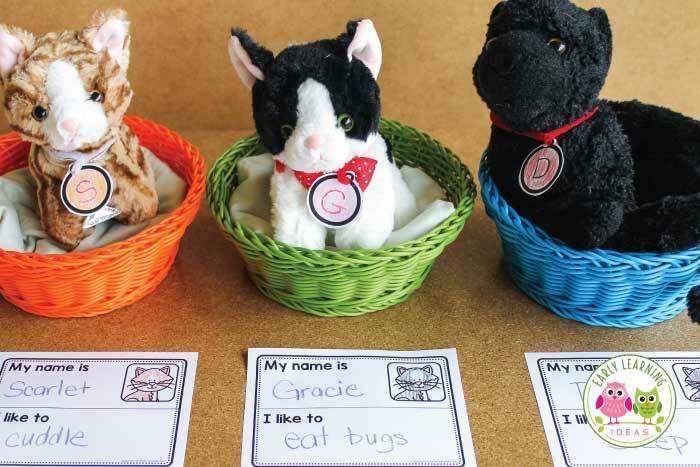 Additional signs, forms, labels, and word cards can be found in the Animal Shelter Dramatic Play Set found in my store. I hope you find these ideas helpful as you set up an animal shelter in your dramatic play area. Enjoy watching your kids give lots and lots of love to the pets.